Loni is back! We are thrilled about her return! Loni worked at TSO for 15 years until she decided to leave to spend more time with ailing family. She started as an insurance billing clerk with Dr. Webb and stayed on after Dr. Sher bought the practice. While working for Dr. Sher she became the office manager. 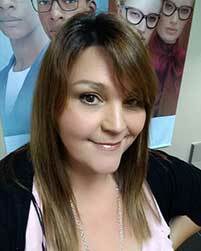 She now is working as an optician in the optical and enjoys finding our patients that perfect frame! Loni’s fun attitude and sassy personality definitely matches up with our crew!